When we lose a loved one, photos of family times together remind us of the memories and comfort us. Grief therapists share the many ways our photos can help us grieve…and heal from the loss we feel. 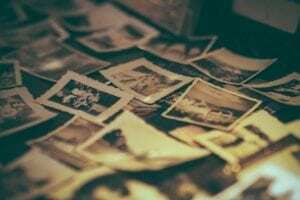 Photos help us remember what made our loved one special and keep them in our minds and hearts. Images of happier times may take our minds off of their last days and bring their whole lives back to us. They remind us of personalities and hobbies, and of the travels we shared. Think about it – we take pictures to help us remember special times. After a loss, they can do that all over again. Many people find comfort in displaying photos of a loved one. They choose images that bring to mind a happy memory or event. They can show the images to family and friends and tell the funny stories that accompany them, because laughter helps the healing. Some families may choose to have each person select a photo that means something special to them and have an evening of storytelling about their loved one. It can be helpful to organize photos so that they can be easily shared and viewed with several family members. They can be categorized and housed in a photo box. Or with today’s technology, it is relatively easy to digitize photos to send out via email or keep an online photo library with Instagram and Facebook. For large volumes of photos, it may be worth contacting a professional photo organization to scan and organize photos for you and create photo books. Probably the most popular idea is, as your funeral home, we will have you select your most favorite photos and we will put together a tribute video that you can share not only at the service but with others via the obituary from our website. And, you will be surprised how many times you will review and enjoy the reminder of the traits that made your loved one unique. It’s also a special way to remember your loved on their birthday or the anniversary of their passing. Photos help us heal. They are more than just images of the past…they can help us deal with grief and preserve our connection with the most meaningful moments of our lives.